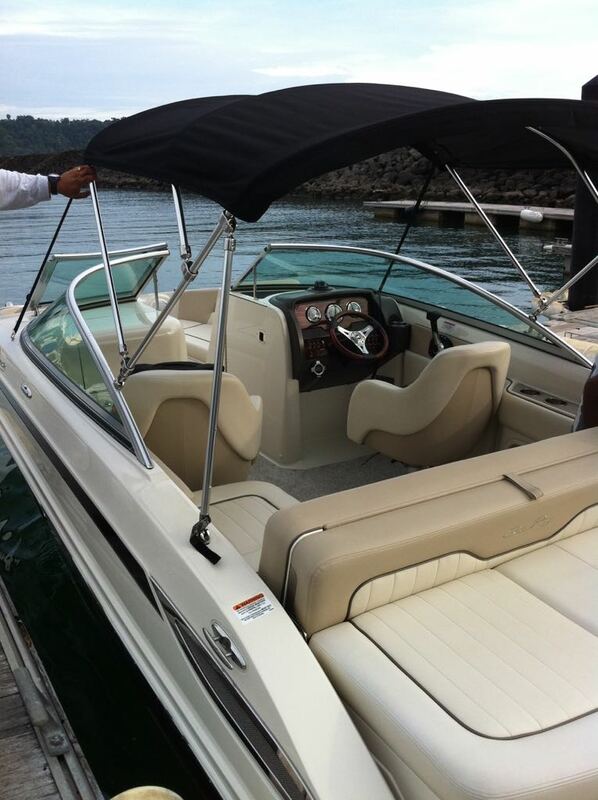 Constructor: Sea Ray Boats Inc. Yachts Measurements: Lenght: 23' Engines: 5.0L (260HP) MCM SeaCore (260hp) Sterndrive. ALL SERVICE by US Certified Mercury Dealer. Speed Cruising Speed: 25 mph. Maximum Speed: 42 mph - Tanks Fresh Water Tanks: (10 Gallons). Fuel Tanks: (45 Gallons) - Electronics Depthsounder, VHF, Radio/ CD player, Cockpit speakers, Compass. - Inside Equipment Electric bilge pump, Marine head. 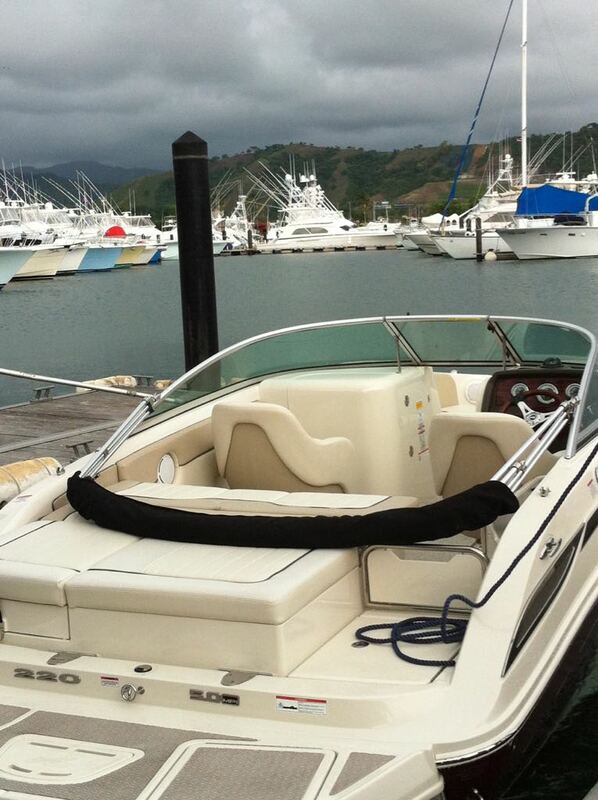 Jose Maria Torra, has delivered more new boats in Costa Rica than any other broker/dealer. Email, call + (506) 8816 7156 or send your contact information filling the form below. Will be back to you in minutes, thank you ! Thank you, we will be back to you in minutes. Probably the best 22 feet sport boat in the country. 2010 Sea Ray 220 Sundeck with Mercruiser ECT 5.0L MPI BR3 MCM with Shorelander with 2nd Axle disc brakes Trailer is now available and loaded with options. All annual services have been completed during ownership. This boat comes with a very stylish two tone gel coat graphics, pearl and burgundy, black sumbrella canvas and mooring cover, VHF Radio, Cockpit table with dedicated storage, air compressor, bow filler cushions, beach boarding ladder, pump out head, fresh water sprayer and fire suppression system. The 220 Sundecks wraparound windshield is just like the one youll find on Sea Rays larger Sundecks, constructed of tempered and tinted glass. Theres a fiberglass bow block-off door below this windshield to limit air flow into the cockpit while the vessel is underway. This is another feature you wont find on too many deck boats this size. 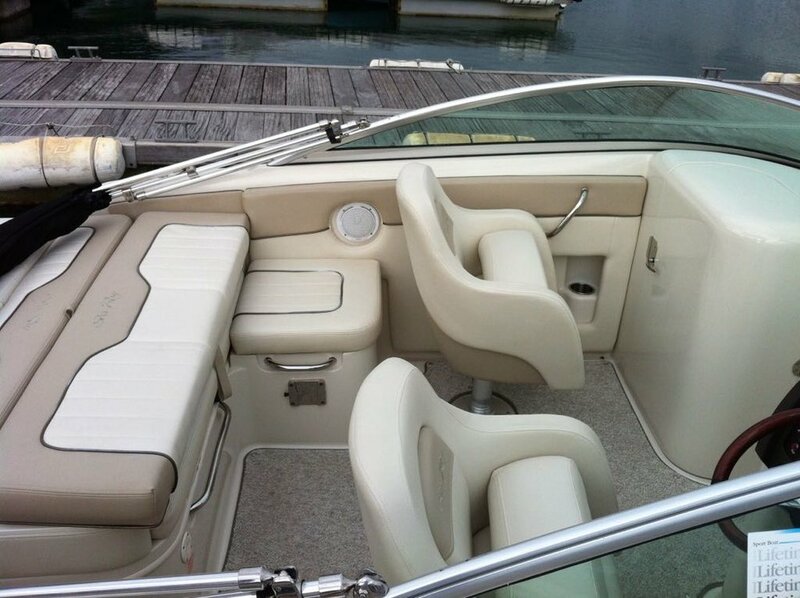 For those who crave the wind-in-their-hair freedom that bow riders provide, the 220 Sundeck offers a pair of lounges up front with integral armrests and cup holders. These bow seats are deep and perfectly shaped for safe, comfortable reclining. Theyre also hinged to provide access to big port and starboard storage compartments. At the nose, an optional telescopic ladder can be added for no-hassle boarding from the shore. Twin bucket seats welcome the driver and companion; both seats swivel and slide and have flip-up, thigh-rise bolsters. A lockable fiberglass head compartment in the port console means less dockside restroom stops, therefore, more time for family fun. The helm console and its soft-touch, keyless dash could be straight out of a luxurious sports car. The same could be said for the chrome-bezel gauges and lighted switches. In addition, steering is power-assisted, with a tilt wheel and the Clarion stereo with CD player, four speakers and MP3 port. A smooth-gliding throttle and shift with built-in trim connects to the standard 5.0L MerCruiser MPI Bravo III MCM (260 hp - 194 kW) gas sterndrive, which comes ready to rock n roll with a stainless-steel propeller. Based on a 21-degree-deadrise hull, the 220 has no trouble flying across the waves and cutting sharp, strong turns. An L-shaped bench provides plenty of room for guests to stretch out, while an in-floor storage compartment offers a secure space for gear and water toys. This hatch locks and has vinyl matting inside to protect all the goods. An acrylic door leads to the swim platform, where another big-boat item awaits in the form of an aft-facing bench. 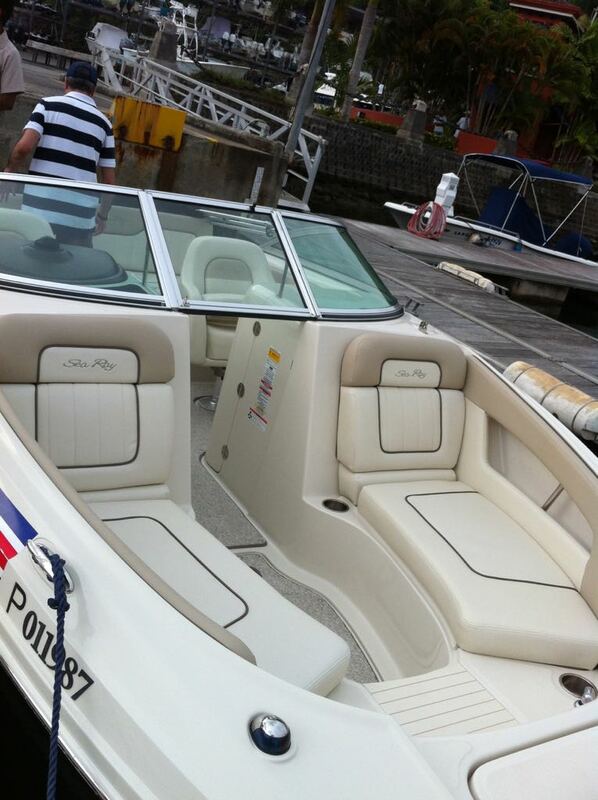 Sit back and watch the kids swim, or just see your friends as they ski below this speed boat. Neat. I have seen a lot of this boats and this looks like new. 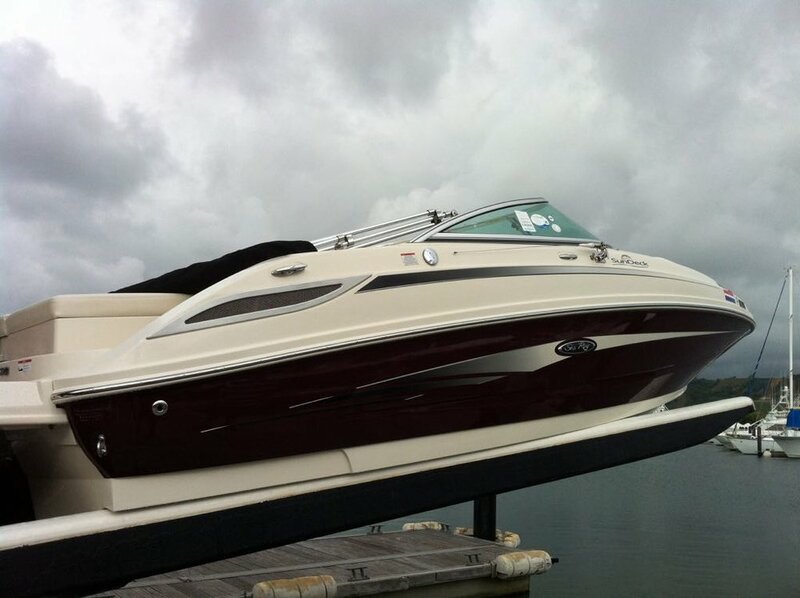 Recently serviced by US Certified Technical - Official Sea Ray Dealership.